Lexington, Ky. – US Equestrian has named four athlete-and-horse combinations for the FEI Dressage Nations Cup Germany and four combinations for the CDI4* at the World Equestrian Festival CHIO Aachen, July 17-22, 2018. The Nations Cup CDIO5* and CDI4* will serve as a designated observation event for determining the 2018 The Dutta Corp. U.S. Dressage Team for the FEI World Equestrian Games™ (WEG) Tryon 2018, which will take place Sept. 11-23 in Mill Spring, N.C. An additional observation event will take place at Leudelange CDI4*, July 3-8. Information regarding The Dutta Corp. U.S. Dressage Team’s selection procedures for the 2018 WEG can be found here and a list of the designated observation events can be found here. The U.S. will also be represented at CHIO Aachen by the Land Rover U.S. Eventing Team in the FEI Eventing Nations Cup™ CICO3* Aachen from July 19-21 and the NetJets® U.S. Show Jumping Team in the FEI Jumping Nations Cup™ CSIO5* Aachen on Thursday, July 19. Find out more about the World Equestrian Festival CHIO Aachen. Support The Dutta Corp. U.S. Dressage Team by following the USA Dressage on Facebook and US Equestrian on Facebook, Twitter, and Instagram. 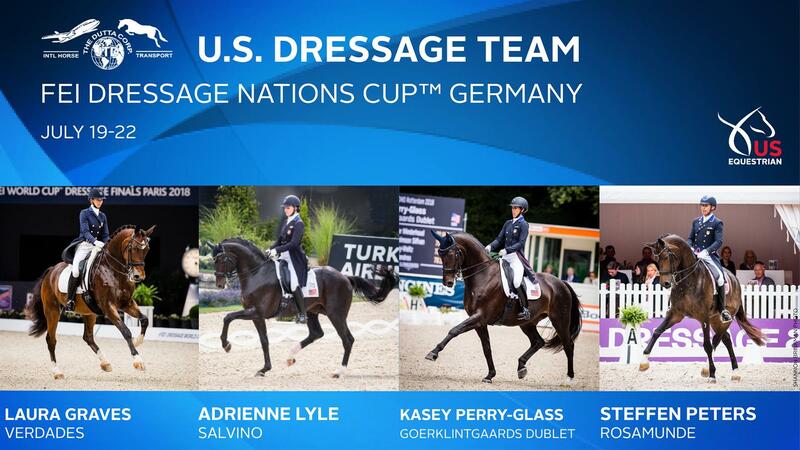 Use #USADressage and #FEINationsCup.